Xiaomi launched Xiaomi Mi 8 Youth Edition a few days ago in the Chinese market. Now, this phone is being prepared in the name of Xiaomi Mi 8 Lite in the global market. Actually, Mi8 Lite is a weak version of the Xiaomi Mi 8 flagship smartphone launched in May. It has a 6.26 inch LCD panel and Qualcomm Snapdragon 660 processor. Three variants of this smartphone were launched in the Chinese market. These are: 4 GB RAM / 64 GB storage, 6 GB RAM / 64 GB storage and 6 GB RAM / 128 GB storage. Xiaomi also launched Mi8 Screen Fingerprint Edition with Mi 8 Youth Edition. It is set to be called Xiaomi Mi8 Pro in the global market. 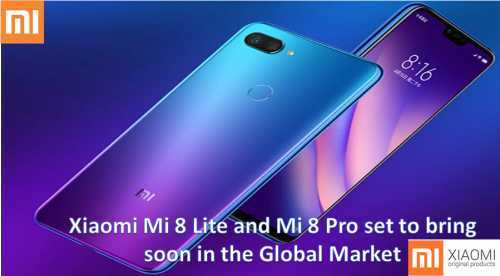 Xiaomi Mi 8 Lite and Mi 8 Pro set to bring soon in the Global Market, Price, specification:- Without disclosing any concrete information about the launch date, the Mi8 Lite from the official Twitter account of Xiaomi revealed that it is coming soon in the global market. The tweet also states that this phone will come with Snapdragon 660 processor, which is also part of the Xiaomi8th Youth. At the same time, Xiaomi's Global Spokesperson, Donovan Sang, has informed that Xiaomi Mi 8 Pro will also be brought to the international market. He posted pictures of M8 Pro and wrote, "This superb phone comes with an option of in-display fingerprint technology and many colors, along with a transparent back edition, it will soon be available in all our global markets "
Xiaomi has not disclosed the price of the Global Mi8 Lite. However, the price of Xiaomi Me 8 Youth Edition in China is 1,399 Chinese Yuan (about 14,800 rupees). At this price, you can get 4GB RAM / 64GB storage variants. The price of 6 GB RAM / 64 GB storage variant is 1,699 Chinese yuan (about 18,000 Indian rupees). MI-8 in the top version of this mobile, you get 6 GB RAM / 128 GB of storage. XiaomiMi 8 screen fingerprint edition costs 3,199 Chinese yuan (about 34,000 rupees). At this price you will get this vareint 6 GB RAM / 128 GB inbuilt storage variants. Mi 8 Screen Fingerprint Edition 8 GB RAM / 128GB storage variant costs 3,599 Chinese yuan (about 38,200 rupees). Dual-SIM Xiaomi Mi8 Lite runs on the Meu based on Android. Mi 8 Lite and Mi 8 Pro has 6.26 inch LCD display, you will get the Nokia design in the upper part of the phone. Qualcomm Snapdragon 660 AI Chipset is used in Xiaomi Mi 8 Lite for speed and performance. It will come in 4 GB / 6GB RAM and 64 GB / 128GB inbuilt storage variants. Now talk of a camera. Mi 8 Lite and Mi 8 Pro has Two rear cameras have been given in the 8th Youth Edition for photography. The primary camera sensor is 12 megapixels and the secondary camera sensor is 5 megapixels. Its archers are F / 1.9. The rear camera comes with Artificial Intelligence and Dual Phase-Detection Auto-Focus. The 24-megapixel Sony IMX 576 front camera has been given for selfie and video calling of this mobile. Mi 8 Lite and Mi 8 Pro battery of 3,350 mAh is provided for power backup, which comes with Qualcomm Quick Charge 3.0 technology. You can get a Front camera for security and comes with Face Unlock feature. You will get this variant a fingerprint sensor on the back panel of the phone. This connector supports Bluetooth version 5.0 to connectivity. Dual-SIM Xiaomi Mi 8 Pro has a 6.21-inch full-HD + (1080x2248 pixels) Super AMOLED display. Its pixel density is 402 pixels per inch. The smartphone will be equipped with Snapdragon 845 processor with 8 GB RAM and 128 GB of storage. This phone also has dual rear camera setup. A sensor is 12 megapixels, which is equipped with optical image stabilization and F / 1.8 extraction. Secondary sensor is 12 megapixels, its aperture is F / 2.4. This is a telephoto lens. The front panel has a 20-megapixel camera. It is equipped with 3D Beauty and AI Portrait Mode. Xiaomi Mi 8 Pro features 4G VoLTE, Wi-Fi 802.11 AC, Bluetooth 5.0, GPS / A-GPS and USB-Type C connectivity. The battery of the smartphone is 3,000 mAh and the dimension is 154.9x74.8x7.6 millimeters.